The whole dress is princess style for a youthful flare. Big patterned ivory cotton lace appliques inspired design gives this dress a flourish bodice. See through top with scoop neckline and sleeveless style that goes to a keyhole with a button up and zipper closure down for the half sheer back. The first layer of skirt is made of champagne tulle in loose pleated style and would look perfect for a princess style wedding baby girl dress. This super sweet sheer lace tulle flower girl dress is made of high quality fabrics that ensures your little flower girls comfortable to wear. Category: Flower Girl Dresses. Tags: button, champagne tulle, ivory cotton lace applique, keyhole, scoop neckline, sleeveless, zipper back. The whole dress is princess style for a youthful flare. Big patterned ivory cotton lace appliques inspired design gives this dress a flourish bodice. See through top with scoop neckline and sleeveless style that goes to a keyhole with a button up and zipper closure down for the half sheer back. The first layer of skirt is made of champagne tulle in loose pleated style and would look perfect for a princess style wedding baby girl dress. This super sweet sheer lace tulle wedding little girl dress is made of high quality fabrics that ensures your little flower girls comfortable to wear. 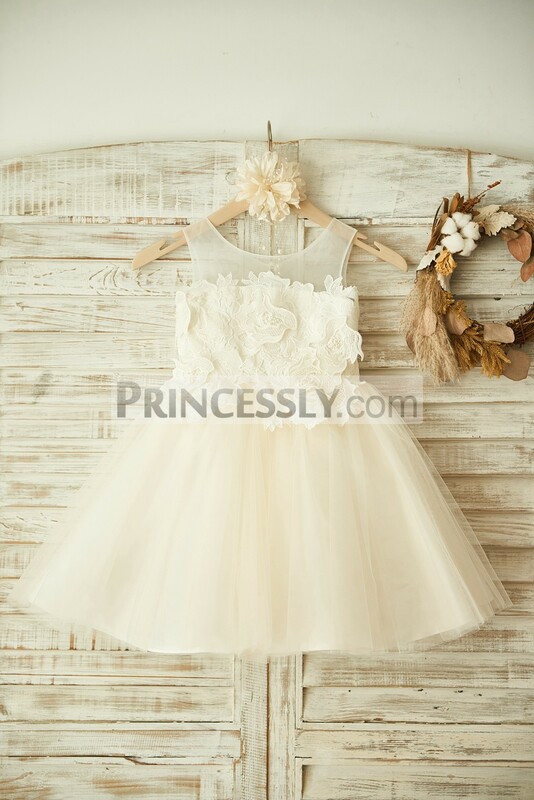 Be the first to review “Sheer Neck Ivory Cotton Lace Champagne Tulle Flower Girl Dress” Click here to cancel reply.